Firstly about wording or language -- to get a solid idea of how people spoke you need to read books written at the time. If you are interested in 19th C Britain -- you should read any or all Jane Austen, 'Vanity Fair' by Thackery, 'Barchester Towers' and others by Anthony Trollope, 'Jane Eyre' and 'Wuthering Heights' by the Brontes, anything by George Eliot, 'The Moonstone' or 'Woman in White' by Wilkie Collins, anything by Thomas Hardy, and of course, Charles Dickens. Some of these are heavy going -- the writing style is alien to us, but even if you just browse them to look at the language, you will be learning. (I've never been able to read Dickens ) Someone else very useful and much easier to read is Flora Thompson. She only wrote a couple of books-- I think the library has them. One title is 'Lark Rise to Candleford'. And then there are people like Georgette Heyer who have impeccable period language although she was writing in the 20th century. Also diaries can be very useful -- Francis Kilvert and John Woodforde were both parsons who wrote diaires, one at the end of the 19th century, one at the beginning. And finally if you want to get technical about words and language you can try "Nineteenth Century English" by Richard W. Bailey from the University of Michigan Press. It's pretty scholarly but very interesting. Something you should know is that research, if you're writing historicals, is a life-long process. There is no quick and easy way to learn it all. Most of us writing historicals find the research way more fun than the writing :) You will need to know your British history really well, and if you're writing emigration type stories, you need to know all you can about that process of emigration as well as 19th century Canadian history. Those will be your basics. After that -- whenever you have time! -- you need to research particular subjects. For example, google or library search 'horse drawn carriages' or '19th century costume' or 'Victorian trades'. And you just learn and learn and learn; but there's no quick way. And remember don't put off writing until you have all the research done. Because you'll never be done researching, and you need to start writing as well as researching. As the heroine in my WIP owns a millinery shop, I have been researching Regency headgear. With hats and bonnets, caps and turbans, plus bandeaux and toques, every woman past maidenhood covered her head outside the home. Surprisingly there is little real examination of the topic out there. How wonderful it would be if someone, somewhere, turned up a definitive manual of the period by and for milliners. Then we could understand exactly what was in the mind of Regency hat-makers, and hat sellers. The term 'millinery' itself comes from the fact that in the 15th and 16th centuries many hats were made in Milan and so became known as 'Millayne bonnets'. London hat makers were called 'millianers', and from there it is a short leap to 'millinery'. Milliners in the Regency carried all kinds of fancy goods in their shops--any combination of gloves, laces, fans, shawls, scarves, combs, artificial flowers and myriad other pretty things. But chiefly they sold hats, made by 'journeyman' and apprentice hat-makers and decorated with an eye to the latest fashions. There are plenty of pictures, and numerous cryptic descriptions of Regency hats such as: 'A scarlet velvet bonnet, with a white ostrich feather'; 'a straw hat turned up at the sides'; 'round beaver close cap, and feather in front, with gold chain-band round the crown'. Abundant questions come to mind on reading the above descriptions. What style is the scarlet velvet bonnet? How wide is the turned up brim on the straw hat? What shape is the crown on that round close cap? - "Small morning or walking hats, trimmed with silk frivolity, are an entire new and very elegant article." - "White muslin bonnet, and long veil of white lace, or muslin." - "A hat of white satin, quilted all over to form diamonds..."
So many details are left undocumented by these descriptions, and the researcher is left wishing to do a closer examination of available records. The best a fiction author can do, it seems, is look at illustrations and use her imagination. How many details, after all, does the reader wish to know? 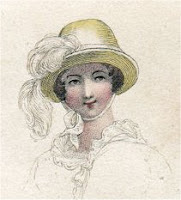 Have you found a good source of information on Regency headgear? Please let us all know! I put up a short story on my new Facebook page yesterday, and it occurred to me that I might post it here as well, in case you missed reading the story on my website. "I see that at long last you have a fan, Miss Morcatt," Lord Rustington bowed over her hand. His grace was the envy of all the aspiring gentlemen of the ton; all eyes in the crowded drawing room of Viscount and Viscountess Casterton were upon them, Chloe sensed it. "It was given me, my lord. 'Twould be churlish not to use it." Chloe snapped open the topic of their conversation with a surprisingly practiced flourish. "You have been loud, in the past, in your condemnation of the articles. 'Pretentious' I think you called the fan. 'Showy', 'superficial', even 'vulgar', I believe." He seated himself beside her on the striped satin sopha without asking her permission. 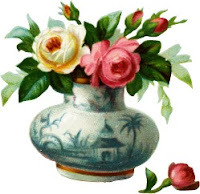 In a nearby candelabra beside one of the many vases of hot-house roses, a candle guttered out with a sibilant hiss. Chloe could only nod. They had been her words. She peeped over the edge of the offending item. Slowly she fluttered her long eyelashes--one of her best features, she had always thought. He laughed. She always thought he looked exceeding attractive when he laughed, when humour lightened the dark intensity of his gaze and the harshness of his features. "Oh, indeed, you have the knack of it already, a born flirt. And who presented you with this trifle?" He indicated the 'trifle'--which sported silver guards, intricately pierced sticks, and finely painted parchment leaves. The flowers limned upon it exactly matched in colour the delicate blue of her evening gown. "A gentleman...a kind and generous sort of person." She teased further, fanning herself until the golden curls at her temples feathered across the pale, smooth skin of her forehead. His gaze followed the curls' movement even as he shook his dark head. "A fool," he said. With a quick movement, she snapped the offending article shut, and rapped him across the knuckles of his gloved hand which rested between them on the striped silk sopha. He raised the hand with some reproof in the gesture. "You..."
"They do say you can send messages with the fan." Chloe had spread the fan and was hiding behind it again. "If both sender and recipient have agreed upon the language, of course." His expression told what he thought of that idea. Chloe gazed about her aunt and uncle's drawing room. The level of conversation was such as to deafen...an hundred voices all speaking at once. Attention had fallen away from them. No one seemed to notice that the Earl of Rustington--noted Corinthian and scholar--was seated beside her and flirting with her in a most intimate manner. In fact, despite the new fan, she was--unusually--attracting no attention at all. She looked at the spread fan thoughtfully. "If I opened and closed the fan quickly, then opened it again, it could mean that I wanted you to come to me...if you were across the room." The earl snorted in a manner decidedly lacking in charm. "If I closed it, and left it closed, it could mean that I wish you to go away!" She suited her action to the words and stared at him challengingly. He returned her stare. "If you open it, and lift it to your face..." He slid closer to her on the sopha. She did not move other than to open the leaves and assume an elegant pose with the fan raised. He leaned toward her until his warm lips nearly brushed her cheek. She turned her head with a languid little smile, and kissed him. After a long moment, the fan which had neatly hidden them from view, clattered to the polished floor. It narrowly missed the Persian carpet which would have muffled its landing. Now everyone in the over-heated, rose-scented chamber was staring at them. Lady Casterton, Chloe's aunt, broke the sudden silence with a laugh. Mrs. Morcatt, standing with her, said to her daughter, "You see, I knew how it would be. I told you Rustington sent the fan only to make mischief." Rustington was laughing again, his expression relaxed as he lounged on the stiff sopha. He openly held Chloe's gloved hand, his thumb unobtrusively caressing her wrist. "Then, as I replied this morning, Mama, it is fortunate we are betrothed." A roguish twinkle, and a smile that neared a grin, displayed Chloe's happiness. The gathering laughed along with her, and returned their attention to gossip of matters more urgent than the month old betrothal of Miss Chloe Morcatt and her Earl. "I suggested fans could be most useful, did I not, my love?" Rustington asked her in an undertone. "But you should not drop yours at such a crucial moment; now I shall have to wait at least until this rout is over before I can kiss you properly." He bent to retrieve gleaming device and when she would have taken it from him, he retained his grip. "I should dislike it greatly if you were to use this fan to flirt with anyone other than me." Chloe spread the leaves and peered over it once more at him. "So should I, my darling." She waved the fan gracefully. "So should I." And visit me on Facebook--my badge is in the column at the right. I have in front of me a Google Book. It was published in 1814 in its second edition, and was authored by J. P. Malcolm. The full title of the book is "Excursions in the Counties of Kent, Gloucester, Hereford, Monmouth, and Somerset, in the years 1802, 1803, and 1805; illustrated by Descriptive Sketches of the Most Interesting Places and Buildings; particularly the cathedrals of Canterbury, Gloucester, Hereford, and Bristol. With Delineations of Character in different Ranks of Life". It is, according to the title page, "Embellished with Twenty-Two Highly-Finished Plates". Why were Regency authors of non-fiction so enamoured of long titles? What was there to gain by adding so many details--specific audiences, wider readership? Did the title replace the back cover blurbs we love? Or was it just a more leisured time? A quick and catchy title wasn't needed; there was time to savour details, even in a book title. Whatever the reason this is a very interesting book. When studying the Regency, particularly its locations--towns, villages and countryside--we can only see it in our own time. Even the best re-creation is just that--a facsimile. And too often it is prepared with the tourist in mind, so it is picture pretty and photo-perfect. The reality of early 19th century England was less idyllic and Mr. Malcolm, who wrote this book and traveled these counties, was not backward about pointing out their shortcomings. He waxed enthusiastic about the picturesque countryside, in keeping with the new enthusiasm for nature and naturalistic harmony, but he could be scathing about towns. And this is the information Regency lovers need--reality. About Bath, he says: "Were a stranger to walk directly through this city, he would observe that the High-street consists of a narrow avenue of churches, palaces, inns, ale-houses, shops, and the worst description of habitations strangely interwoven, with a pavement calculated to break the heads of those who jolt over it, in coaches and other vehicles, amidst a constant noise and rattle of wheels. Every church in Bath appears to have been purposely placed in disgraceful situations." The frontispiece from Malcolm's book shows some ruins in Bath, picturesque perhaps, but also, in his opinion, discreditable. In Bristol Malcolm is interested in the Temple Church, and Temple-street. "The Temple fair is held in and near Temple-street, on the South side of the Avon; where it must unquestionably greatly impede the communication with the London-road. Temple-street, generally filthy, and badly built, derived its name from the Temple church, on the North-east side; … The inducement to visit Temple church proceeds from the very singular inclination of the tower to the West, evidently occasioned by the insecurity of the marshy earth which supports the foundation on that side." The church appears handsome enough in this engraving, and the tower's lean is not obvious! Dover is much more favoured by the author. He likes the situation, is impressed by the cliffs, the sun on the sea, and the very necessary army encampments and naval fortifications of the harbour. But he does comment "Dover commences in a long street, far from being well built. This however improves after passing the market-place; …"
He describes taking in this view in detail, and his engraving shows his delight in it. Mr. J. P. Malcolm, F.S.A. (I don't know what this designation stands for) writes in a pedantic, ponderous style, but he is not impenetrable. And the information he gives on Kent, Gloucester, Hereford,, Monmouth and Somerset in the early years of the 19th century is invaluable to any writer or historian. Once again I am blessing Google Books; how wonderful to have such research material available. I diverge a little from the Regency this week to ruminate on website contests. I am running a new one on my website at http://www.lesleyannemcleod.com/contest.html. 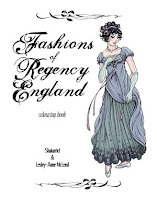 The prize in the new contest is a copy of the Fashions of Regency England Colouring Book. If you sign the guestbook before August 30, you have a chance to win the prize. This is my usual promo blurb and I've been posting it in lots of places. We authors run website contests for profoundly commercial reasons. We want to drive traffic to our websites. And also we want to gather names and addresses for our mailing lists. And our ultimate goal is, of course, to sell more books to the people visiting our websites and populating our mailing lists. These are very self-serving reasons for running website contests. But they are very real reasons too. If I don't sell books, I can't afford to write. Oh, I can write for myself, or for my family, but I can't afford to take the extra time and energy to put my books before the public if I don't do everything I can to sell them. 'Everything I can' means writing this blog, maintaining my website, appearing on Myspace, Twitter, and YouTube. 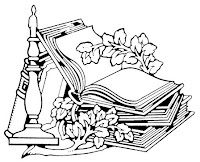 It means offering a prize and publicizing that prize to encourage people to visit my website and hear about my books. When I began my website contest, I had a store of romance-themed book posters left over from my ownership of a bookstore. The posters had been too pretty to throw out but I had no use for them. I thought perhaps other people might enjoy them, so I offered them as my first prizes. People really enjoyed them, but eventually I ran out of them, and looked around for other prizes. I turned to books--Regency and history-themed non-fiction books mostly--they seem appropriate and some are out of print. And I have some other interesting prizes in the offing--hand made Mardi Gras style masks and some handmade jewelry. But right now, I'm giving away prizes from Regency Fancies--because I'm so delighted with our products and thrilled with results of placing Shakoriel's art on useful objects. I'd like to know what you find interesting for prizes and I'd appreciate your opinion on website contests in general. So I give away these prizes on my website for commercial reasons. I also give away things because it's fun. It's often said that the giver receives more than the recipient. That is certainly true for me and my website contest. It pleases me to give someone pleasure, to give them a chance to win something, to give them something pretty or useful. The gift helps my business of course but, more than that, it gives me a lift every time I notify a winner. I hope you will enter my contests, and I hope you will win. Don't forget to sign my guestbook--www.lesleyannemcleod.com!